This in-depth 80-page analysis explores the leading NVDIMM formats, and provides unit shipments and revenue forecasts through 2021. It uses 42 figures and 14 tables to introduce the technology, standards, and applications of NVDIMMs, as well as to explain those software changes being introduced specifically to support this new storage format. The leading 13 NVDIMM suppliers are profiled, and definitions are provided for the different NVDIMM formats now being produced and developed. The report concludes with unit shipment and revenue forecasts for different NVDIMM formats. 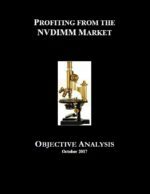 The report can be purchased for immediate download at http://Objective-Analysis.com/Reports.html#NVDIMM.